The budgeting process is a tool for setting goals and objectives to recognize weaknesses or inadequacies in organizations, and for controlling and integrating the diverse activities performed by many agencies within large organizations, both public and federal. Budgeting requires inspection of the organizational resources that have been used in the past, evaluation of, and planning for what is to be accomplished, and programming a course for the future by allocating new resources for the coming budget period. Zero Based Budgeting (ZBB), an analytical technique was developed in 1969 in a private organization, Texas Instruments. It was first applied to government by Governor Jimmy Carter in the preparation of his fiscal year 1973 budget. After that in 1977 President Carter mandated its use in the federal government. Major aim of this mechanism is to achieve an optimal allocation of resources that incremental and other budgeting systems cannot achieve. Managers are asked to identify and justify their areas of work in terms of decision packages prior to starting the work. A zero-base budget necessitates managers to rationalise all of their budgeted expenditures, instead of the more common approach of only requiring justification for incremental changes to the budget or the actual results from the previous year. Therefore, a manager is supposedly presumed to have an expenditure base line of zero. Zero-base budgeting is an actual management tool which is extensively used in business, non-profits and government organizations. This system provides more scrutiny and transparency in the budgeting process. Though it is initially introduced for government use but small businesses can also get advantage from the use of zero-based budgeting to find ways to reduce costs, invest limited resources more intentionally, and evaluate the benefits of budgeted tasks or projects. It is a system of planning and decision-making that opposites of the working process of traditional budgeting. In traditional incremental budgeting, departmental managers explain only variances versus past years, based on the assumption that the "baseline" is robotically approved. In zero-based budgeting, every line item of the budget must be accepted, rather than only changes. Zero-based budgeting needs the budget request be reassess systematically, starting from the zero-base. This process is autonomous of whether the total budget or specific line items are increasing or decreasing. Zero-Base-Budgeting was developed in the decade of 60s at Texas Instruments by Peter Phyrr. Zero-Base-Budgeting is a financial and management approach which help policymakers accomplish more cost- effective delivery of public services. In actual situation, a manager is expected to have a lowest amount of funding for basic departmental operations, above which additional funding must be reasonable. The main objective of the process is to constantly refocus finance on business objectives, and dismiss or scale back any activities no longer related to those objectives. Sarant stated that, Zero-Base-Budgeting is a technique which complements and links to existing planning, budgeting and review processes. It identifies alternative and efficient methods of utilizing limited resources. It is a bendable management approach which offers a trustworthy justification to reallocate resources through systematic appraisal and explanation of the funding and performance levels of current programs. Zero-base budgeting was also initiated in the federal government by President Jimmy Carter in 1977 to control program costs. After that, this process was improved in various governments. Studies indicated that Zero-base budgeting is more suitable for private businesses. In some cases, private businesses have been more prosperous through this exciting process than governments. There are two steps to the process of zero based budgeting. The first step is to develop what is called as "decision packages". The second is to rank the decision packages. The decision package is a document that identifies and explains the specific and goals and objectives, measurement of performance, costs, benefits and alternative courses of action. Ranking of decision packages is then accomplished at each management level until a comprehensive agency wide ranking is obtained. Conceptually, zero-base budgeting is a system approach to allocating resources where they will do the most good. The extent of application must be decided in next phase of zero-base budgeting. Next stage is to prioritize the activities. The important phase is cost benefit analysis. Last step is to select, approve the decision package and finalize the budget. Argyris studied the impact of budgeting on organizations in the 1950s. Many studies have shown that budget processes used in organizations have some behavioural effects. It has been observed that the particular process used could lead to dysfunctional behaviour in subordinates, irrespective of the degree of technical modification of the budgetary system. In the decade of 1970, Hopwood's studies investigated the effects of budgets on human behaviour and results found that the use by seniors of a budget-constrained style of assessment increased significant levels of job-related tension, had adverse effects on peer and subordinate-boss relationships, and was implicated in manipulative behaviour on subordinates. Zero-based budgeting may necessitate more time, money, and paper work, but it offers a systematic method of addressing an organization's financial issues and enable an organization to better allocate its resources. A blend of zero-based budgets with rolling budgets or some other form of budgeting that spreads the work of justifying new budgets each cycle is way to integrate zero-based budgeting without undue stress at the same time for all managers with budgetary accountability. Organizations who adopt zero-base budgeting get numerous advantages. Zero-base budgeting needs that managers recognise alternative ways to implement each activity, as well as the effects of different levels of spending. With these alternatives, the process makes managers consider other ways to operate the business. Budget inflation is another benefit. Since managers must link expenditures to activities, it becomes less expected that they can artificially expand their budget. The change should be easily to spot. The zero-base budget should trigger a significant debate among the management team about the corporate mission and the way it can be accomplished. A zero-base budget review process compel managers to decide which operation is appropriate to the company. Such force enable managers to target non-key activities for elimination or outsourcing. Since the zero-base budgeting conception force managers to define the various missions of their departments. The evaluation may disclose that the same activities are being conducted by numerous departments, leading to the elimination of the activity outside of the area where management wants it to be centred. Companies who implement zero-base budgeting on a regular basis can examine various aspects periodically. It can be established that zero-base budgeting is microeconomic tools to change objectives into efficient operating plans. With advantages, there are some drawbacks of using zero base budgeting. The main disadvantage of zero-base budgeting is the very high level of effort needed to examine and document department activities. This is a difficult task even once a year, which causes some entities to only use the procedure once every few years, or when there are noteworthy changes within the organization. Another substitute is to require the use of zero-base budgeting on a rolling basis through different parts of a company over several years, so that management can deal with fewer such reviews per year. Zero base budgeting needs an enormous amount of analysis, meetings, and reports, all of which requires extra staff to manage the process. Some managers may try to manipulate their budget reports to concentrate expenditures under the most important activities, thus ensuring that their budgets will not be reduced. It can be problematic to control or validate expenditure levels for areas of a business that do not produce "concrete," tangible results. The operational evaluation authorized by zero-base budgeting requires a significant amount of management time. Managers need special training in the zero-base budgeting process, which further increases the time required each year. Service-level budgeting is a modified zero-base budget approach. This matches spending levels with services to be accomplished. Under zero-base, there is an attempt to document personnel and expense requirements that are readily accepted as necessary. Modified zero-base can evade this by developing a base that is higher than zero. The term service level budgeting is sometimes better account of this process. To summarize, Zero-Based Budgeting is effectual cost alteration effort that successfully implement resource planning. 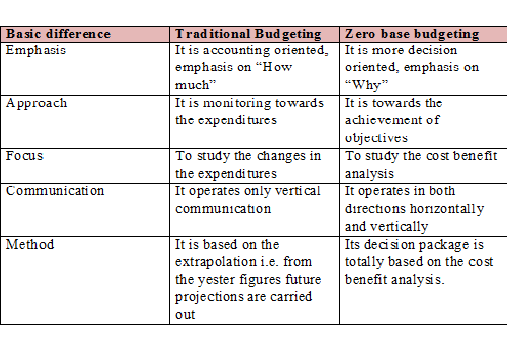 Zero based budgeting is explained by theorists as 'budgeting from the ground up, as though the budget is being prepared for the first time with every proposed expenditure coming under review'. (Horngren et al, 1996) Zero-based budgeting is a management process to budgeting, in which the budget for every activity begins with zero for each new budget period. An analysis of this practice in a non-profit setting is important because Zero-Based Budgeting is applied in local and government organisations where predominant costs are of a flexible nature (Drury, 2004). It differs from traditional budgeting processes through investigating all expenses for each new period, not just incremental expenditures in obvious areas. Zero-Based Budgeting forces managers to analyse all spending and requires justifying every expense item that should be kept. It facilitates companies to profoundly reshape their cost structures and increase competitiveness. Zero-Based Budgeting analyses which activity should be executed at what level and frequency and scrutinises the way these could be better performed through streamlining, standardization, Outsourcing, offshoring or automation. The process is supportive to align resource allocations with strategic goals, though it can be time-consuming and challenging to measure the returns on some expenditures.